I usually write my blog-posts in german. This one is in english, because Sami Laiho asked me to do a short write-up, to make this problem available to a broader audience. Who is affected and what’s the problem? 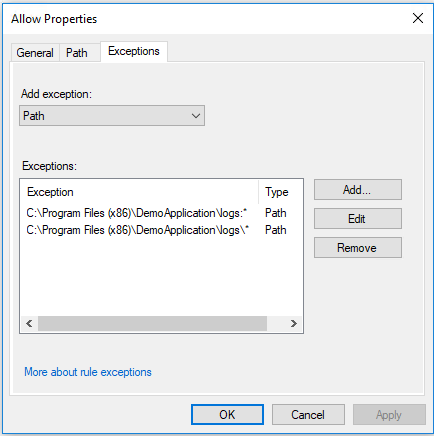 If you are using AppLocker Application-Whitelisting using Path-Rules with Exceptions you are probably affected. See the following example to understand, what type of problem we have to fight against. 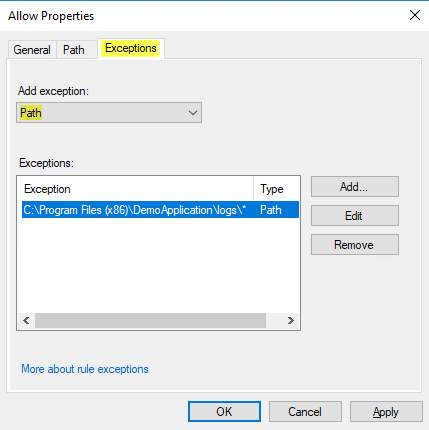 As this application is not authenticode-signed, you create an AppLocker path-rule: Allow to execute everything in DemoApplication, but exclude the logs-directory (as this is user-writeable, so otherwise a user or a malicious process could put a binary there and execute it). If you are not aware what Alternate Data Streams are, check out this blog-post. So, what’s the trick to bypass AppLocker: We copy the contents of an executable to an Alternate Data Stream of the logs-directory. To be clear: Not to a file in the logs-directory, but to an ADS of the logs-directory itself! The copy-job is done using the “type” command redirecting the output to an ADS. The execution of an ADS can be done by various ways, one way would be to use wmic to create a new process, but there are other ways too. So – bad situation. How to prevent this? Why did AppLocker allow the execution, even if we excluded the logs-directory? Which Versions of Windows are affected? All versions I tested so far, at least I can say: Every Windows 10 Version – including the newest v1803 Release (final Insider preview, tested on 08. April 2018) are affected. Why doesn’t Microsoft prevent this? I don’t know. I reported this behaviour twice. I cannot see any useful or legit case, where executing an Alternate Data Stream is needed. In my opinion there should be a single checkbox “prevent all ADS from being executed” which should be on by default – but AppLocker doesn’t handle ADS this way I would like to see. Is this behaviour a problem? Yes – I really think it is. And I’m not the one who originally “found” this bug / bad behaviour. If you do a google-search, you can find other sources explaining this problem – not exactly in detail like I did here, but I’m quite sure this is a very well known and commonly used AppLocker-Bypass trick. I think almost nobody of the SysAdmins out there is aware of the fact, that you have to set ACLs on the writeable directories in a way you cannot add ADS, or have to configure two Exclude-Rules for every writeable path. As Microsoft seems not to change AppLocker behaviour, you should be aware of this and maybe double-check your Path-Exclusion-Rules soon! Thank You! this is just awesome.